In a recent prayer email to our prayer partners I wrote a request to pray for our 2 minivans. Combined they have over 400,000 miles on them. I included the odometer picture you see here. Last week, Gina called me while I was on my way to meet with a friend about partering with our Paris Church Planting ministry. Gina said the car had broken down. She said that it was low on gas but that the car would start and is running right now but when she gives it gas it sputters and dies. But, it would start back up. I started putting the pieces togehter like dying on the road, running ,though running badly, and over 250,000 miles. My initial diagnosis was DOA engine (thrown rod). I arrived and got it in the car to start it. Guess what? It wouldn't start any longer, but it did sound OK. I quickly grabbed the gas can I through in may car on the way out the door, went to get some gas and put it in the van. It started right up and purred like a very, very old kitten. Yep that minivan has taken a licking and kept on ticking. I guess the prayer team really did pray about our cars. 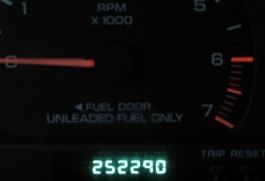 As of this morning it has 253,968 miles on it. Should I try driving this thing from NC to TX and back for Christmas?